The very latest in Home Deco fragrance. 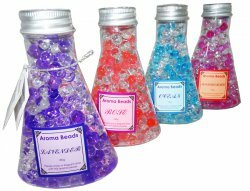 New Aroma Beads are tiny coloured gel balls just bursting with delicious scent. Simply unscrew the top and your home will be filled with a refreshing fragrance wherever you want.